Economist, National Geographic (stunning photos, also here), and New Scientist (reg required). The 19 Dec 1903 first flight story is corrected here. Also, a pair of non-scientific, hand-drawn airgraphs (acceleromaps? seismographs? ): an Airbus A321 takes off from Edinburgh and lands at London Heathrow. (There are tube journeys as well). See the Circle, Metropolitan and Hammersmith & City lines use the same tracks! Gasp as the Northern line tunnels twist back and forth over each other! London Transport Railway Track Map. 1525-1530: Hans Holbein The Younger (1497-1543), Tower of Babel, illustration for Martin Luther's German translation of the Bible, Basel? c. 1575? : Marten van Valkenborch (1535-1612), Tower of Babel (also here), or possibly Lucas van Valkenborch, c.1530-1597? c. 1575? : Peter Balten (1525-1598), Tower of Babel, c.1575? 1775: Joseph Strutt, Tower of Babel, engraving from Of the Inhabitants of England, from the Arrival of the Saxons, till the Reign of Henry the Eighth. With a Short Account of the Britons, during the Government of the Romans, 2 vols. (London: Benjamin White, 1775-76). Also: several Towers of grammar or wisdom by van Ems (1350), Lull (1512), Vogtherr the Elder (1548), etc. In which a Northern Line train on London's Underground collaborates with the artist on 4 Dec 2003 to make some drawings. Tufnell Park to Kentish Town and Kentish Town to Camden Town. The train is conveying the artist in a sitting position, and the direction of travel is to the left. Camden Town to Kentish Town and Kentish Town to Tufnell Park. 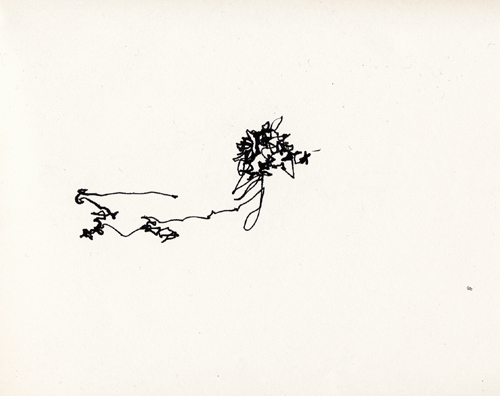 The train is conveying the artist in a standing position, resulting in a looser line, and the direction of travel is to the right. Presence, privacy and mobiles: Rheingold on Location-aware devices, privacy, and UI design ("the same technology that could let you know if a good Chinese restaurant or old friend is in the vicinity could also betray your location to a totalitarian government, neighborhood spammers, and your vindictive ex-spouse") and Presence. Also: Dodgeball's concept of circles and scouts. People think it's this veneer -- that the designers are handed this box and told, 'Make it look good!' That's not what we think design is. It's not just what it looks like and feels like. Design is how it works. Haircuts from the left and from the right drawn at the Transport Research Group/LSE Cities' Future Vision: Future Cities conference, 6 Dec 2003. If you were there and recognise your hairdo, do, please, get in touch. Perhaps there will be more notes from this event in due course, but for now let's just say that it had some good moments, but tried to do too much. Related: the hairlines of AIGA, from 6 Aug 2003.